Cricket — indoor location system from MIT. In a nutshell, Cricket uses a combination of RF and ultrasound technologies to provide location information to attached host devices. Wall- and ceiling-mounted beacons placed through a building publish information on an RF channel. [...] The listener runs algorithms that correlate RF and ultrasound samples (the latter are simple pulses with no data encoded on them) and to pick the best correlation. Even in the presence of several competing beacon transmissions, Cricket achieves good precision and accuracy quickly. Square Wallet and Square Register aren’t just mobile applications, they are a profound rethinking of the entire business process of buying something at a retail location. They combine not just one but two mobile applications, a cloud-based data backend with payment information, identity, and perhaps even your purchase preferences at a merchant you frequent, location-based check-in, and more, all woven into a seamless experience. Software above the level of a single device. Retail will never be the same again. The Apple Store has got a lot of the same magic. Gone is the cash register. Clerks instead wander the store, offering advice, and, when you’re ready to buy, they hand you your product, and offer to email you your receipt. Your name and credit card are already on file. You and the sales clerk are already part of the system. Software above the level of a single device. Or consider Uber. You look on your phone. The nearest car is three minutes away. You choose the car and driver you want – perhaps based on proximity, but perhaps on the basis of user ratings of the driver. When the driver is outside, you receive a text message. When you arrive at your destination, you simply thank the driver and step out. Payment information is already on file. Software above the level of a single device. Magic. This is only the beginning of a great rewiring of every aspect of business processes and interactions. The web was never just about content, but always about building the infrastructure for a kind of internet operating system. The first apps on that operating system were thinly upgraded versions of what went before, but the true native apps are starting to arrive. Software above the level of a single device. Magic. 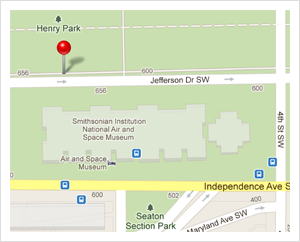 Google's decision to start charging for its Maps API is leading some companies to mull other options. StreetEasy's Sebastian Delmont explains why and how his team made a change. Dart is a new structured web programming platform designed to enable complex, high-performance apps for the modern web. Kathy Walrath and Seth Ladd, members of Google's developer relations team, explain Dart's purpose and its applications. Jim Stogdill is tired of running on the info treadmill, so he's changing his media habits. His new approach: "Where I can, adapt to my surroundings; where I can't, adapt my surroundings to me." We can't forget that data is ultimately about insight, and insight is inextricably tied to the stories we build from the data. Subject experts are the ones who find the stories data wants to tell. A recent O'Reilly customer survey revealed unusual results (e.g. laptops/desktops remain popular ereading devices). These sorts of insights are made possible by O'Reilly's direct sales channel. Where Conference 2012 is where the people working on and using location technologies explore emerging trends in software development, tools, business strategies and marketing. Save 20% on registration with the code RADAR20. Computational linguist Robert Munro says the subtleties of spatial distinctions are growing in importance as more of the world's digital information takes the form of non-English, unstructured text. Several game developers have decided that game funding and Kickstarter are two great tastes that taste great together. Ralph Waldo Emerson's essay on "Compensation" was a source of inspiration for Henry Ford. It also affirms some of the cosmic truths Steve Jobs held dear. Featuring: Hadoop creator Doug Cutting on the similarities between Linux and the big data world, Max Gadney from After the Flood explains the benefits of video data graphics, and Kaggle's Jeremy Howard looks at the difference between big data and analytics. Remember the days before you could pull your smartphone out of your pocket and get instant directions from your current location to anywhere in the world? It's kind of foggy for me, too. In fact, I'm so used to relying on my smartphone that I feel increasingly flustered when wandering the aisles of Costco, locating the elephant house at the zoo, or searching for decent food at the airport. Shouldn't my magical pocket computer help me with this, too? The answer is "yes," of course. But there are challenges to implementing indoor navigation today. The maps app on your smartphone has one primary concern: getting you from 106 Main Street to 301 Sunny Lane, or from work to home, or from home to Taco Bell. Why are you going to Taco Bell and what percentage of your taco beef will be meat filler? The app doesn't need to know. Thus, the typical interface for a smartphone maps app is a big map and a search box. You might assume that an indoor navigation app for, say, the American Museum of Natural History has the same primary concern: getting you from the main entrance to the T-Rex. But why go to the T-Rex? How do I know there's a T-Rex here anyway? And what if my kids have 20 things they want to see and we only have two hours to see everything? And what's going on this week — are there special exhibits? 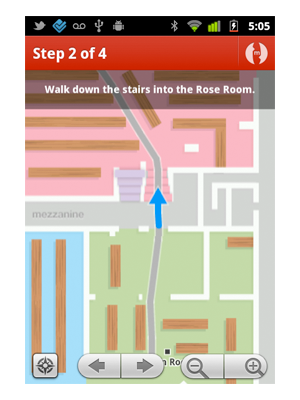 It turns out that creating a useful indoor navigation app requires more than navigation. So, an effective mobile UI should be more "smart guide" and less "paper maps" on your smartphone. It's a design challenge, like any other mobile app. Help visitors decide where they need to go first, then direct them there. Getting directions to the plumbing section of a store is certainly useful. But let's say you're looking for a particular Delta kitchen faucet. Wouldn't it be more useful to search in a retail app for "Delta faucet," check that it's in stock, then get directions right to that product? Who cares if it's in the plumbing section or the kitchen section? To be truly useful, an app needs to integrate with dynamic data. Similarly, a university campus app could offer to guide a student to "Kennedy Hall Room 203," but wouldn't it be better to search for "Econ 101" instead? Who cares where Econ 101 takes place today? Even better, just have students enter their name once, fetch their schedule, and automatically take them to whatever their next class is. Why make users do more work than they have to? OK, so you decide you want directions to that Delta faucet I mentioned earlier. Ideally, the app will automatically start from your current location. Now comes the great sadness: GPS, as you may know, does not work indoors. The satellite signals are just too weak to penetrate anything much thicker than the metal roof of your car. However, all modern smartphones have Wi-Fi built in, and wireless networks are common enough in indoor spaces that an app could easily scan for known access points and calculate your position using trilateration. Here's the catch, however: Unlike the wide open world of Android, developers on the iPhone side aren't allowed to perform these Wi-Fi "signal scans." Fortunately, there are alternatives. One approach is to make the building do the work instead of the device. Some Wi-Fi installations, such as the Cisco MSE, can determine the location of any wireless device in the building. The access points themselves listen for the Wi-Fi signals created by your phone, then estimate its position via trilateration. This solution has been deployed successfully at a few locations, including at the American Museum of Natural History. One consequence of most indoor positioning systems is a lower degree of accuracy compared to GPS. For instance, indoor systems can usually guess which room you're in, and that's about it. Precision depends on signal fluctuations, which depend on factors like how many people are in the room, how you're holding your phone, and other vagaries. An effective mobile app must design for this reality from the very beginning. One technique that will help users greatly is to point out quickly recognizable features of the environment. The Meridian app, for example, uses a short text label to describe each direction step. (Disclosure: I'm the CTO and co-founder of Meridian.) Below, "Rose Room" is clearly marked in the "real world" space and easy to spot, as are the stairs headed down. The Meridian app uses step-by-step text labels. The best way to combat inaccuracy, however, is by making it as easy as possible for users to self-correct. In the Meridian app, the map can easily be dragged, rotated, zoomed in and out, and the turn-by-turn steps can be flipped through with ease. If the starting location isn't perfect, the user will instinctively drag around and figure it out. Building amazing indoor app experiences is not only possible, it's already happening. This year alone, many places — from stadiums and retailers to museums and corporate campuses — have launched apps that are used by hundreds of people every day for navigation and to access location-based content. Indoor Wi-Fi positioning technology isn't a research project anymore; it's out there and works with the devices we all now carry. With the right user interfaces, it can be just as effective as GPS is outdoors. It's time to spread the incredible experience of wandering around a place as enormously complex as the History Museum without ever feeling lost. A busy week at Casa Turner, as the infamous Home Renovations of Doom wrap up, I finish the final chapters of "Developing Enterprise iOS Applications" (buy a copy for all your friends, it's a real page turner! ), pack for two weeks of vacation with the family in California (Palm Springs in August, 120 degrees, woohoo! ), and celebrate both a birthday and an anniversary. But never fear, WIR fans, I'll continue to supply the news, even as my MacBook melts in the sun and the buzzards start to circle overhead. If you decide to install Lion Server, you may notice something missing from the included software: MySQL. Previous releases of OS X server offered pre-installed MySQL command line and GUI tools, but they are AWOL from Lion. Instead, the geek-loved but less widely used Postgres database is installed. It seems pretty obvious to the casual observer why Apple would make this move. With Oracle suing Google over Java, and Oracle's open source philosophy in doubt, I know I wouldn't want to stake my bottom line on an Oracle package bundled with my premiere operating system. Apple could have used one of the non-Oracle forks of MySQL, but it appears they decided to skirt the issue entirely by going with Postgres, which has a clear history of non-litigiousness. Meanwhile, Oracle had better be asking themselves if they can afford to play the games they've been playing without alienating their market base. Apple has bee been hit with a penalty from the South Korean government that's a result of the iPhone location-tracking story that broke earlier this year. Now, Apple may have more money than the U.S. Treasury sitting in petty cash right now, but it will be difficult for them to recover from such a significant hit to their bottom line: a whopping 3 million won, which works out to a staggering ... um ... $2,830. Never mind. Java 7 was recently released to the world with great fanfare and todo. This week, we got a reminder why using an X.0 version of software is a risky endeavor. It turns out that the optimized compiler is really a pessimized compiler, and that programs compiled with it stand a chance of crashing. Even better, there's a chance they'll just go off and do the wrong thing. Java 7 seems to be breaking new ground in non-deterministic programming, which will be very helpful for physics researchers working with the Heisenberg uncertainty principle. What could be more appropriate for simulating the random behavior of particles than a randomly behaving compiler? It's hard to ignore the big story of the week: the launch of Google+, Google's latest stab at social. Google+ is comprised of several pieces, namely Circles, Sparks, Hangouts, Mobile, and Huddle — content and photo sharing, video chat, and mobile messaging. It's an ambitious project to be sure, particularly — as most pundits are quick to point out — with Google's less-than-stellar track record in the social space. The reviews a few days in seem mostly positive, with the observation all around that what Google needs to be successful here isn't simply a good user experience, but, well, users. The approach that Google has taken with Google+ purposefully differentiates it from other social networks, and the emphasis is on users' control of their own personal information. Google describes those other networks as "sloppy," "scary" and "insensitive." Rather than utilizing the blunt instrument of "friend" or "follower" to describe all relationships, Google Circles allows users to classify them on a more granular level: not simply "friend" or "family" or "acquaintance," but also self-created labels. Google says this is part of its larger effort to give users better control of their own data (see video below). What remains to be seen is if that's something most people are interested in, particularly if it means reassembling relationships and designing Circles on yet another social network. Rumors have been circulating for some time that Yahoo was planning on spinning its Hadoop division into its own separate company, and this week Yahoo and Benchmark Capital announced the formation of Hortonworks to do just that. The news, first reported by GigaOm's Derrick Harris, means that a small team of engineers from Yahoo will create a separate company to provide support and services for Hadoop users. By incorporating next-generation features and capabilities, Hortonworks hopes to make Hadoop easier to consume and better suited for running production workloads. Its products, which likely will include higher-level management tools on top of the core MapReduce and file system layers, will be open source and Hortonworks will try to maintain a close working relationship with Apache. The goal is to make HortonWorks the go-to vendor for a production-ready Hadoop distribution and support, but also to advance Yahoo's repeated mission of making the official Apache Hadoop distribution the place to go for core software. Earlier this year, Yahoo discontinued its own Hadoop distribution, recommitting all that code and all its development efforts to Apache. Hortonworks, which takes its name from the elephant in Dr. Seuss's "Horton Hears a Who! ", will compete with others in the commercial Hadoop space, including Cloudera. The buzz has died down substantially from the iOS location news that Pete Warden and Alasdair Allan broke here on Radar earlier this year. But it's not gone altogether. Such are the hopes of author James Bridle who has self-published his own personal mapping history in "Where the F**k Was I?" The hardcover book costs $160, so I'm not too sure it's destined to be a bestseller. But the idea is brilliant nonetheless. The book is 202 pages long, with a separate page for each day between June 2010 and April 2011. Each page is a map, with more than 35,000 of Bridle's locations mapped via OpenStreetMap, along with a note about what he did that day. He's taken digital data that was created by spying on him and he's converted it to an analog form. He's also selling the data that Apple took for free — data that was recorded surreptitiously by one party, and now anyone can have it. SpotRank, a data service offered by Skyhook, taps hundreds of millions of location points to predict "the density of people in predefined urban square-block areas worldwide at any hour, any day of the week." In a recent interview, Ted Morgan (@tedmorgan), co-founder and CEO of Skyhook, discussed potential applications for density data. The SpotRank data is incredibly rich and it's also new. So, there's a lot of experimentation going on and pilot [programs] using it as ways to suggest hot places to go at the moment or even the best time to go to a restaurant before it gets busy. A lot of brands and advertising agencies are looking at ways they can target based on this kind of human density data. We're working with retailers as they figure out where to put their next store based on pedestrian foot traffic. Daytime movement and demographic data is something that has never existed before. It's a gold mine, except it takes a while to change how everyone's been using people data. It's still in the early days, but it's incredibly valuable, and it's frankly why all the big platforms are fighting to protect and control their own location data — they know this SpotRank-like information is going to drive most of the marketing and planning and behavioral analysis going forward. What does the attention around tracking mean? Current augmented reality technology primarily relies on the cameras in smartphones to connect users to surrounding environments. But is this interaction actually disconnecting users from reality rather than plugging them in? In a recent interview, Foursquare co-founder Dennis Crowley said the camera sometimes gets in the way. Crowley said a more subtle interaction could actually result in a deeper connection to the surrounding environment without interfering with what's happening in real life. Augmented reality, like holding up your phone and looking around? I'm not very bullish on that. But, you basically get the same results if you put the phone in your pocket, and it buzzes when you're near things — that's like a poor man's augmented reality, which I'm very bullish on. Disclosure: O'Reilly AlphaTech Ventures is a Foursquare investor. 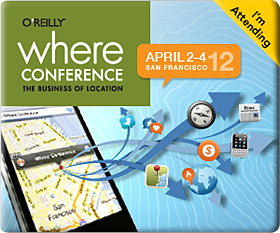 The Where 2.0 Conference was held April 19 - 21 in Santa Clara, Calif., so it's no surprise there were plenty of location-based developments to talk about this week in the data space. Here are a few of the data stories — place-based and otherwise — that caught my eye. On Wednesday, Pete Warden and Alasdair Allan made headlines with the story of their discovery of an iPhone file that tracks its owner's location. The iPhone appears to use cell-tower triangulation to periodically record user's latitude and longitude, storing the data in a file that lives on the iPhone and is transferred to a user's computer when the device is synced. According to their research, the file appears to be part of iOS 4 update, as that's the point from which the recordings start. While the existence of the file raises some questions — what are Apple's plans for this data — more disconcerting may be that the file is unencrypted, leaving this trove of location data stored locally but unprotected. Apple doesn't transmit the data, it appears, but no other device seems to have a comparable file, according to Warden and Allan. 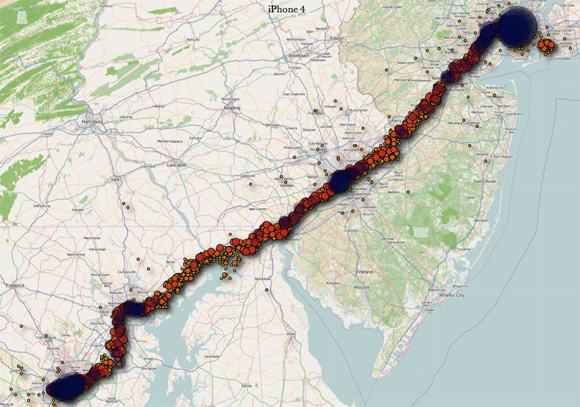 While there are questions about privacy and security here, the data is quite compelling, thanks in no small part to the iPhone Tracker tool Warden and Allan have built that will read this file on a user's computer and visualize their movements. Your phone has surreptitiously been tracking you, but the maps replay a fascinating and fairly accurate record of where you've travelled since June 2010. Crowdsourced data versus "real statistics"
Ushahidi co-founder Eric Hersman wrote a strong defense of crowdsourced data this week in his post, "The Immediacy of the Crowd." His blog post served as a response to one that appeared last month on the social enterprise organization Benetech's blog. The title of the latter post -- "Crowdsourced data is not a substitute for real statistics" — probably demonstrates immediately why Ushahidi would object. The Benetech post (along with a subsequent Fast Company article) suggests that crowdsourced data from mobile phones and SMS can "lead rescue teams in the wrong direction" and that that data might not be good for statistical analysis or modeling. On one hand, this is an interesting and important academic debate here. Which is better, crowdsourced data or statistical patterns? Are there patterns in crowdsourced data that we can use, in aggregate or as predictions in real time? But the back and forth between the blogs, as Hersman observes in his post, overlooks an important element: Crisis response is messy and hardly a "clinical environment where we all get to sit back, sift data and take our time to make a decision." It's been almost two years since the U.S. Senate agreed to make the official record of its expenditures publicly available online. This week the Senate finally revealed its plan to release the information. According to the Sunlight Foundation, the Senate will begin to release records in November. This will cover the period from April to September. The legislation was rather clearly intended to create the release of actual data, not data in the difficult-to-reuse form of a paper document. Unfortunately, PDF documents can meet the standard of searchable (as long as the text is exposed), and itemized (if the items are listed), so the Senate is getting by on a technicality, and reaching for the lowest common denominator. How do we demand more accessible, structured datasets? Or, how do we challenge the PDF? Today at Where 2.0 Pete Warden and I will announce the discovery that your iPhone, and your 3G iPad, is regularly recording the position of your device into a hidden file. Ever since iOS 4 arrived, your device has been storing a long list of locations and time stamps. We're not sure why Apple is gathering this data, but it's clearly intentional, as the database is being restored across backups, and even device migrations. The presence of this data on your iPhone, your iPad, and your backups has security and privacy implications. We've contacted Apple's Product Security team, but we haven't heard back. What makes this issue worse is that the file is unencrypted and unprotected, and it's on any machine you've synched with your iOS device. It can also be easily accessed on the device itself if it falls into the wrong hands. Anybody with access to this file knows where you've been over the last year, since iOS 4 was released. All iPhones appear to log your location to a file called "consolidated.db." This contains latitude-longitude coordinates along with a timestamp. The coordinates aren't always exact, but they are pretty detailed. There can be tens of thousands of data points in this file, and it appears the collection started with iOS 4, so there's typically around a year's worth of information at this point. Our best guess is that the location is determined by cell-tower triangulation, and the timing of the recording is erratic, with a widely varying frequency of updates that may be triggered by traveling between cells or activity on the phone itself. We have built an application that helps you look at your own data. It's available at petewarden.github.com/iPhoneTracker along with the source code and deeper technical information. As we note around the 20-minute mark in our video discussion, an immediate step you can take is to encrypt your backups through iTunes (click on your device within iTunes and then check "Encrypt iPhone Backup" under the "Options" area). Well, half the smart phone world, anyway. Gartner Research is predicting that Google's Android operating system will continue its drive to become the most popular mobile OS in the world and, by the end of 2012, could own about half the market. Windows' mobile will pick up share, too, more than doubling to about 11% over the same time. Where will all that market share come from? Gartner sees Symbian dropping like a rock as Nokia ports over to Windows. Perhaps more surprising, Mashable's Ben Parr noted with a tad of skepticism, is Gartner's prediction that Apple's iOS will peak this year and begin to dip by next. Predictions are always a little sketchy, but there's no doubt Android is gaining share and significantly reshaping the smartphone and mobile markets by packaging its app-friendly platform onto inexpensive hardware. This week AT&T announced a prepaid smart phone, the LG Thrive, following the lead of Verizon, which began offering prepaid smart phones last autumn on RIM, WebOS and Android handsets. Google has also been working with telecom carriers to make buying apps from its marketplace as seamless as it is over at Apple's App Store. AT&T and Sprint will now add the app cost to your monthly bill, so no need for a credit card or even Google Checkout. Where is it all heading? Gigaom's Om Malik talked with Juniper Networks chairman Pradeep Sindhu to get his thoughts. In a brief conversation that ranges from the IBM 360 to the cloud, Sindhu made the point that smartphones as platforms will not only place greater demands on the network but will also change the way we think about it, blurring the lines between what is mobile and what is web. 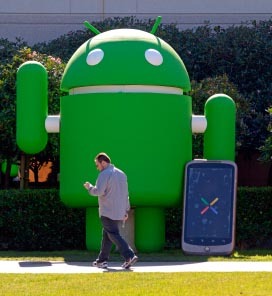 For a more hands-on and tactical view of where it's going, developers might want to look at the sessions in the Android track at next month's Google Developer Conference, May 10-11, in San Francisco. Bus and subway riders in China have already been using prepaid cards equipped with near-field communications (NFC) technology to pay for their rides. With the infrastructure to receive their payments already in place, it should be a relatively easy switch to put the NFC card inside their phones instead of their wallets. NFC World's Christopher Brown said that Watchdata, which produces both types of cards, has produced more than 3 million NFC SIMM cards for mobiles, complete with a little antenna that sticks out of the card slot. The third million shipped in the past four months, Brown noted, so the pace is quickening. China Telecom has distributed most of the cards, but competitor China Unicom is also trying out the phone cards, launching a program in Beijing that goes beyond transit into theaters, markets and restaurants. No word on whether the external antenna is an annoyance. But we're pretty sure it's a temporary inconvenience since handsets in the not-too-distant future will probably put the NFC circuitry and its antenna inside the phone. Quova's Location Developer Challenge wants to know: Where U At? Quova, which offers ways to help websites know the locations of their visitors, is holding a Location Developer Challenge to promote its nascent developer program. If you have an idea for an interesting location-aware web app, or a fresh take on visualizing location data, take a look at the details. They'll be spurring on promising contestants with monthly spot bonuses of $500 and then sending the winner to the Future of Web Apps conference in Las Vegas June 27-29, to show off the winning app. While much of the buzz around geolocation centers around mobile apps, Quova's business focuses on fraud detection and geographically targeted ads for website visitors from desktop and laptop browsers. "We're not a mobile play," said company spokeswoman LaurieAnne Lassek in a phone interview, "but the web is not going away." Quova draws on a database of 3 billion publicly available IP addresses, mostly in North America and Europe. It opened its API last November and is just beginning to build a developer program. Registering for the program gives you access to the API and up to 10,000 queries on their data. "When you start to monetize the product, we work out a revenue-sharing deal," Lassek said. Note: Quova will be at next week's Where 2.0 Conference in Santa Clara, Calif. Applying biometric matching to location-based surveillance technologies produces both fascinating possibilities and scary scenarios. I recently spoke with Tactical Information Systems CTO Alex Kilpatrick and Mary Haskett, co-founder and president, about the state of biometrics and what we need to be concerned about as surveillance becomes more prevalent in our society. They'll expand on many of these ideas during a session at the upcoming Where 2.0 Conference. What is biometric matching and how might it be used in future consumer applications? Alex Kilpatrick: Biometrics is the science that studies things that make an individual unique. Interestingly enough, there are lots of things that make an individual unique, especially when examined closely enough. The most common is fingerprints, but the pattern of ridges on your palms and feet are just as unique. Your iris, the colored part of your eye, is extremely easy to read and unique, even among twins. The shape of your ear, the way you walk, the size of your hands, your smell, the way you talk, and of course your face are all unique. Biometric matching comes in two forms: verification and identification. Verification is when I come to a sensor and say "I am Alex Kilpatrick" and the sensor verifies that one of my biometrics, perhaps my face, matches the biometric on record. This type of matching is relatively easy. Identification is when I present a biometric to a system and ask it "Who is this?" That is a much harder problem, especially when there are hundreds of millions of records. The FBI deals with this problem every day, taking unknown fingerprints from crime scenes and looking for a match in their database containing millions of records. Like most technologies, biometrics can be used for good or evil. In consumer applications, it can be used to help prevent identify theft by providing strong authentication for financial transactions. It can be used for convenience — to allow you to login to a computer, or gain entry to your health club without having to remember a password or carry an ID. Disney World uses biometrics to prevent season pass holders from sharing their passes with other people. It can be used to identify people who can't identify themselves, such as Alzheimer's patients, autistic children, very young children, people in accidents, etc. Mary Haskett: I think the entire industry is holding its breath and waiting to see what's going to happen in the consumer space. The potential is enormous and current methods, like a card or code that you have to show or recite, are actually quite crude. But everyone is wondering if the consumer will accept it. Are they willing to use their fingerprints, face image, or iris image in these ways? How are biometrics being used in surveillance technologies? Alex Kilpatrick: In terms of "surveillance society" activities, there are only two players: face and iris. There are technologies such as gait — the way you walk — that may theoretically be used to monitor people, but these are not discriminating enough to uniquely identify individuals. For a biometric technology to be effective for covert surveillance, it has to be able to detect you from a distance without your knowledge. Currently, face matching is the only biometric technology that supports covert surveillance, meaning that you can be tracked without your consent. However, it is not robust in situations involving poor lighting, poor cameras, or poor angles. Face matching is very effective for "passport"-style controlled poses, but its accuracy drops off rapidly with shadows, or with the traditional angles used by current surveillance cameras. Outside of face, there are iris cameras available now that can detect an individual at distances up to 2-4 feet, but these require the cooperation of the individual — they have to look at the sensor. The bottom line, though, is that there are not any broadly effective biometric means of covert surveillance available right now. That will change in the near future, though. The most "promising" technology for covert surveillance is 3D face matching. This uses a three-dimensional model of an individual's face, so it is much more robust when matching partial faces, or faces at low angles from surveillance cameras. These systems are not currently effective for large populations, but research is progressing rapidly in this area. I would guess that this technology will be mainstream in the next 5-10 years. Iris technology may also advance to become effective without user participation as well. Your iris is effectively a barcode to a computer, and it provides a much better system for matching than a face. For iris to be effective for covert surveillance, better cameras with highly adaptive focusing systems will need to be developed. That said, the advancement of biometric technology may ultimately be a moot point because many people carry around a GPS tracker with them all the time in the form of a smartphone. These devices can track your location down to 10 meters if they use GPS, and 300 meters if they use triangulation. That may not be accurate enough to place you at a particular location, but it is enough to build a pretty accurate profile of your activities. The devices can be activated (including GPS) without your consent, if required by law enforcement or other authorities. What are some of the pros and cons of location-based surveillance tech? Mary Haskett: If you consider apps like Foursquare and Gowalla to be location-based surveillance technologies, and I do, then you've already experienced some of the benefits. I've run into people who were at the same cafe where I was eating and I was very happy to get a chance to connect with them. I've tried restaurants based on seeing people I know check-in and comment on their experiences. But I will also sometimes choose not to check-in at a restaurant because I don't want to hear my kids complaining "You had sushi for lunch? Why don't you ever take me when you get sushi?" Alex Kilpatrick: Like so many technologies, the advantages are a double-edged sword. When I travel, I can meet up with people in the cities I am visiting, but I also have a social obligation to meet up with those people, even when I may not feel like being social. I can track my kids on their way home from school, but they can never have the covert thrill of going somewhere they probably shouldn't go. A restaurant can offer me a free dessert for checking in, but I can also be targeted by a deluge of ads based on where I'm walking. The biggest disadvantage of these technologies is the continual erosion of the expectation of privacy. As people share more, there is less of a societal need to keep things private. This results in people sharing more than they should, as well as a troubling lack of concern about what companies are doing with their data. Scott Adams, of Dilbert fame, wrote a great blog post about living in "noprivacyville." In this thought experiment, he took privacy to an extreme — would you be willing to have every aspect of your life tracked in exchange for 30% lower cost of living? Insurance companies are already offering discounts if you are willing to have them install a GPS tracker in your car, and accept continual surveillance. Those companies can save a lot of money if they can see how you really drive, and adjust your costs accordingly. Many people would welcome 30% savings, and they will probably feel like they aren't changing their behavior at all. But it's a slippery slope. Once you accept surveillance in one aspect of your life, it's easy to let it slip into another. Before you know it you're paying a 30% premium to have a browser that doesn't track all of your web activity. The biggest danger to society is not the technologies themselves. Technology can be controlled. The biggest danger is that over time our society will just accept surveillance as part of the cultural landscape. How can people protect themselves from unwanted surveillance? Alex Kilpatrick: There are "dazzle" techniques that can be used to degrade face matching — contacts can block iris matching, a rock in your shoe will fool gait sensors, etc. However, all of these approaches are stop-gap measures. They don't address the fundamental root of the problem: Ultimately, as a society we have to decide that we will accept some risk in exchange for living in a truly free society. The biggest barrier to unwanted surveillance is knowledge and vigilance. Knowledge about where it is occurring, knowledge about what is being done with the information, knowledge about who is behind the surveillance and what their motivations are. Learn to ask "Why do you need this?" and "What if I leave this blank?" Vigilance is about protecting your privacy; don't share personal information unless there is some real value to sharing it, and only share information with the people who absolutely need the information in order to do their job, or with people you trust. Once you share the information, it's out of your hands. Trusting a company to protect it is not a viable long-term strategy. The only long-term strategy is building a society where people value privacy and are willing to fight for it.